Absolutely adorable. Another great video! Love the different techniques you have shown. Most of the “gold” products have been new to me. Thank you for showcasing them. Seeing what they are and how the can be used is very helpful. Love your card!! Great colors!! Love the backgrounds. 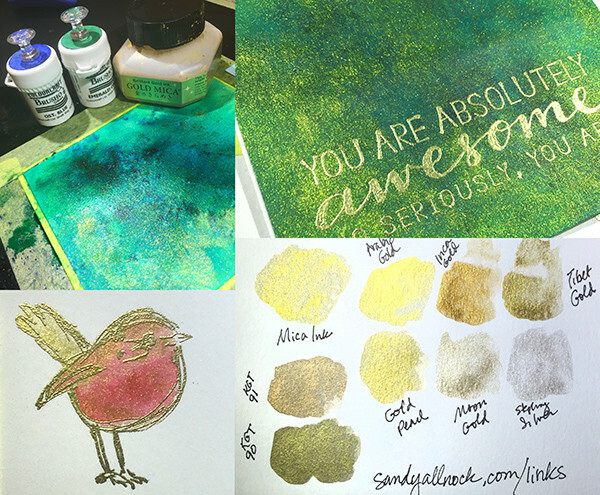 You are putting me in the mood for Christmas cards – can’t wait to add this beautiful gold mica ink to mine. Thank you for all the techniques and comparisons. The gold mica is beautiful and I love the color and shimmer. Is it as easy to use as you make it look? I love your card, the sky and reflection look awesome. The colors you picked to go with the gold are so pretty. I love the cute little scene too. Love the card. Love seeing the difference so I can choose. Thanks for all you do. Great card and product comparison (I love those), so I can decide which I like best before I head out to EH or SSS for goodies! Sooooooooo pretty! I like the Kuratake Mica the best…but then, I like that shade of gold! Thanks for sharing! I’ve so enjoyed the last few days of Go for the Gold. Thanks for the free class, Sandy. I love watching you create! Can’t wait for the rest of the videos. I am loving this class and all the featured products. I also love the scopes (except for the last two night ones on Wednesday–too distracting with the loud music and tv. I like the music when you are mostly coloring and not talking, but when you ARE talking and there are other voices talking and rapping it makes it hard to concentrate on what you are saying). But anyway thanks for all the instruction and encouragement! LOVE these classes! Thank you so much of taking the time! Now I understand why my salt just refused to come off! Thanks so much for that information and this great series. Thank you for teaching this class I look forward to each new video. I love the background you did with the Zig pens. I think I prefer the Micca gold the most, if I had to pick. Very very beautiful. I love the shimmer the mica leaves once it is truly dry. I am sorry to leave this here but did not know how else to contact you. 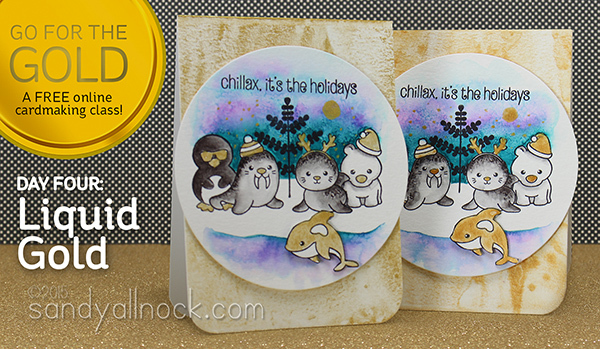 There is another powder water color out that comes in jars (so may need to find something else to put in) but it is called Lindy’s Stamp Gang Magical Watercolors. Some are flat and some are irredescent. Jenny from Craft Test Dummies did a periscope on them (may be able to katch it) and if not, there is a youtube video of the review. They look promising in that they won’t totally reactivate. What a lovely comparison of these two gold products. Your aurora backgrounds are so pretty too!!! great comparison of the products! Beautiful background, love how you did this card. Lovely gold. Adorable card today! Love the touch of gold! Off to view the video! Another great video. Thanks so much for comparing the products! Such a big help! I am loving these go for the gold classes! Thank you so much for all that you do in sharing your talent and knowledge with the crafting world!! One question (and maybe the problem is on my end) but I was having a hard time hearing you today because the background music was much louder than your voice. Love the card! Thank you for the video comparing the two products! Hi Sandy,too fun.I bought this critter set and the essential so I’m excited to try this.I’m not tech savvy but been trying to learn how to put my cards on.I’ve been learning daily technique to use on my cards from you.The comparisons are wonderful too.Ready for my next class teach.LOL. Beautiful cards. Love the product comparison. How does the Kuretake Mica Gold compare to the Finetec set of 6 mica gold watercolours please? I love your background of turquoise and lavender. What a yummy combo that is perfectly accented by the gold. This has been such a fun series. Thank you AGAIN for all your hard work and long hours of research, creating, filming and editing! Beautiful! I really like the look of the mica paint! your card turned out wonderful!